Grow Young with Your Dog - A Book Review and Giveaway! Thank you to all who entered the giveaway and congratulations to Shanna, the winner of Mary’s signed copy of Grow Young With Your Dog! Do we have to accept that as we get older we’re going to feel old and tired? 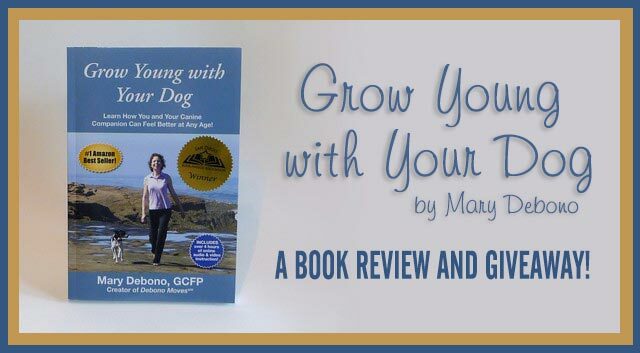 Mary Debono challenges that way of thinking, both for people and their pets, in her book Grow Young with Your Dog. Now that Haley’s a senior dog and I’m—well, not exactly a spring chicken anymore, the idea of staying fit and healthy along with Haley really appeals to me. I want to enjoy our hikes together for years to come and you probably feel the same way about spending quality time with your pup too. Mary contacted me recently to ask if I would be interested in reading and reviewing her book. I was thrilled that she asked because I was already a big fan of her book and had intended on writing an article about it. Since I already purchased the book on my own, we decided to give a copy to one of you! Mary Debono is a lifelong animal lover with over 20 years experience in helping thousands of animals overcome physical and psychological challenges. She’s a Certified Feldenkrais® Practitioner who has combined that knowledge with animal bio-mechanics, behavior and training knowledge to create her own technique known as Debono Moves. She’s worked successfully with dogs, cats and horses at her practice in Encinitas, CA and has traveled around the world teaching her techniques in workshops. She shares that knowledge with us in her book and her passion for helping animals and people can be felt on every page. What Does It Mean to Grow Young With Your Dog? Mary explains in her book that we don’t necessarily have to accept that we’re going to feel worse or have less energy as we get older and that our thoughts and perception of aging can limit our movements. She connects and communicates with animals through gentle hand contact and movements which can lower anxiety, ease arthritis, heal injuries and even regain movement after paralysis. Debono Moves utilizes neuroplasticity, which is the brain’s ability to form or reorganize new neural pathways in response to injury or disease when other pathways have been forgotten or turned off. 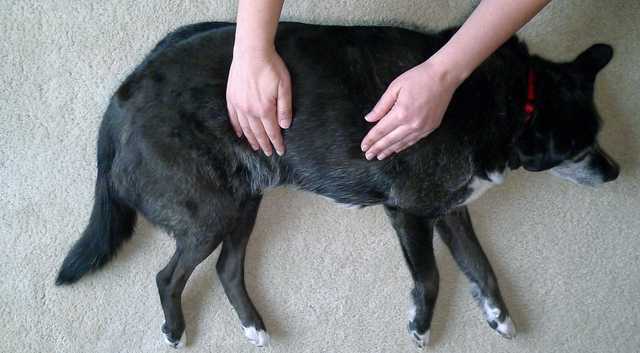 Through these movements and exercises, both you and your dog can regain a more youthful state together by using the power of touch and connection. Mary’s book has specific chapters devoted to helping dogs with back problems, neck problems, hip dysplasia and of course, the all too common knee injuries. After Haley’s CCL knee surgery last year, I relied on some of Mary’s theories and techniques. Right after her surgery, Haley came down with a severe case of colitis which went undetected until a fever presented itself. She was in such pain for several days that she held her injured knee high and tight to her belly and refused to lower it at all. Once she was feeling better from the colitis, holding her knee up had become a new habit and she was behind schedule in her rehab progress. Limping around on three legs and constantly pivoting on her good foot was putting a lot of extra stress on her good knee. In order to get her to lower her leg and begin the process of walking on it again, I used gentle touch and pressure on her upper thigh while she stood on three legs. The light but constant pressure helped her relax her leg a little at a time. After several sessions, she finally brushed her toenails on the carpet, then gradually put more and more weight on her leg. Then, I followed up with Mary’s technique (page 88) where I supported Haley while slowly and carefully shifting her weight to all four legs in a circle. The exercises taught her to relax and trust that she could put weight on her leg again. I was so relieved to get her back on track with her rehab. Whew! 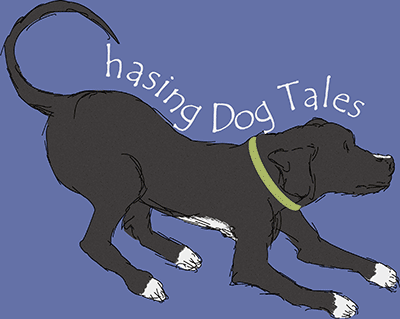 If you have an older dog, Chapter 7—Enhancing the Life of the Older Dog, offers practical tips and exercises to help keep your dog moving more freely. But Mary’s book is not just about helping older or injured dogs. It’s about helping all dogs feel younger and more energetic. Active or athletic dogs can benefit from these exercises too and may see a reduced risk of injury and enhanced athletic ability. If you happen to have a reactive or anxious dog, Debono Moves exercises can help reduce stress and enhance your pup’s overall well-being. Chapter 8 is devoted to exercises just for you, but there are also human exercises incorporated into many of the techniques you do with your dog. One of the most valuable benefits of using Mary’s techniques, is the strong bond it creates between you and your dog. And, while you’re helping your dog, you’re reaping the benefits of touch and relaxation too. Grow Young with Your Dog offers practical, easy to understand techniques and exercises that you can use right away to improve the health and well-being of you and your dog. Mary highlights several cases where she’s helped dogs and provides explanations and the techniques she used to get a positive outcome for each dog. The book is well organized so you can quickly jump to the section you need. Each chapter highlights a specific area or problem being treated and includes exercises and key points to review at the end of the chapter. There are plenty of pictures to help illustrate Mary’s techniques. One of my favorite topics covered! In Chapter 2—Getting to Know Your Dog in a New Way, Mary shows you how to use your hands to feel and learn about your dog’s anatomy. This method of listening with your hands can help you spot potential trouble areas in movement. Although Mary’s book is ideal for anyone with a senior dog or a dog that’s dealing with a condition that affects their movement, I would recommend it to any dog owner because of the many benefits you and your dog can enjoy by practicing Debono Moves. As a bonus, the book also includes access to additional audio and video files via Mary’s website. To be entered to win a signed copy of Grow Young with Your Dog, leave a comment below and explain how you think Debono Moves would benefit your dog. I’ll choose a winner at random on February 14th, 2017. That’s a perfect Valentines Day gift for you and your pooch! The winner will be contacted via their email address. Please note: Due to the nature of this giveaway, it’s only open to people with a mailing address in the Continental United States. Thank you, Mary, for providing a copy of your book for one lucky reader. Good luck to all of you! If you don’t want to enter the giveaway but would like a copy of the book, simply head over to Mary’s website then click on the book to order a copy! Are you ready to grow young with your dog? Yes! I bought it a few years ago before Haley was a senior girl and it’s been so helpful to us. Thanks, Athena and Marie! Mary works with cats too and maybe one day she’ll write a book for our feline friends.? Your review is great. Sounds like a book we certainly need in our library! It’s a great resource, Peggy. I love how so many of the exercises help me and Haley relax and de-stress together. I just looked around Mary’s website and am amazed at all the services she offers. I especially like her workshops, and seeing pictures of her horseback riding workshops reminded me that I’ve been wanting to get back in the saddle. Her book sounds like it is filled with actionable advice and exercises. Thank you for sharing your review with us. I’m pinning it. P.S. Funny that we both posted a book review on the same day 😉 Great minds.. I didn’t know you rode horses, that’s awesome! Yes, that’s one thing I look for in books like these, practical advice that’s easy to follow instead of just a lot of scientific theory. Heading your way soon to check out your book review. Yes, great minds…Haha! ? We all agree we help keep our humans stay young, and knowing our bodies is a good thing for humans to learn how to do. Yes, I love how dogs can be our best training partners. It’s pretty hard to resist that look when you’re thinking about skipping the daily walk, lol! I’m so glad Chops is doing so much better now. I bet you love watching him enjoy his walks with so much enthusiasm. Mary’s book has a whole chapter devoted to back issues if he starts having any pain. Give him a big hug tonight from Haley!? It’s pretty incredible how you utilized these exercises to help Haley! We just got back from a 4 day trip with the dogs with a lot of snow and tons of outdoor activity so this resonates with me. I love this whole concept, thanks for sharing. Aw, I bet Icy and Phoebe had a blast on your trip! I just checked out your post and the pictures are beautiful. It’s awesome that Phoebe had just as much fun as Icy in all that snow too. I really love Mary’s approach to helping dogs too. I think the power of touch is often overlooked when treating injuries and ailments in animals. What a great review, sounds like a great book. Thanks, JoAnn! Your Chessies would probably love some of these exercises. ? How interesting! My babes and I are all starting to get on. My poor Arliss has had two knee surgeries in the past. Some days, he’s creaky and slow and I give him leg massages. Sounds like a beneficial read for all of us. Ugh, those darn knee issues, right? I bet Arliss loves his massages though and hopefully some of Mary’s techniques can help with his mobility too. 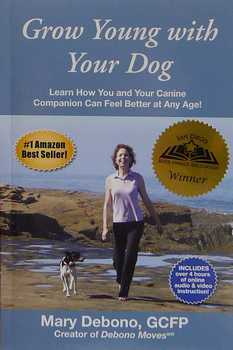 With one senior dog and another dog with epilepsy, I’m sure we would all benefit from this book. Sounds super informative! Great review. Thank you so much! I think the book would be super helpful for both of you dogs. There isn’t a specific section of the book that deals with epilepsy but the benefits of the exercises are wonderful for anxiety, stress and some other issues that could be possible factors along with the epilepsy. Good luck with the giveaway! I am fascinated by her techniques. I am impressed at how you used the techniques to help your dog after surgery. I wonder if my sister’s dog who is experiencing age related arthritis issues might benefit. Using touch to help general health seems like a great way to help your dog and yourself and to build stronger bonds. Thanks for sharing your review of an interesting book! I bet your sister’s dog would benefit from some of these exercises. Sometimes dogs with arthritis end of compensating for the pain by moving in different ways that then put stress on other areas of the body and cause new types of pain. If your sister could help her dog experience less pain with some simple exercises, that would be great! Good luck with the giveaway.? What a fascinating book! While my broken leg will keep ME out of doing any kind of robust exercise for the next few months, I know pug Liam would benefit from some stretches and exercises at home. He had a back injury last summer, and he’s still a morning limper. Would love to try anything that could keep my little guy young for as long as possible. Aw, I’m so glad your crew is giving you lots of TLC and cuddle time right now to help with your healing. I’ll enter you in the giveaway and maybe Liam will be getting some great touch therapy after you get back on your feet. Enjoy all the attention in the meantime!? i like the idea of worrying less about getting older and embracing it more in general. My dogs are getting older too and I’m starting to stress out about all of their aches and pains too. I’ve never heard of this book – and I’m looking up- Certified Feldenkrais® Practitioner! Awesome! Isn’t it funny how we tend to worry less if we do something towards getting healthier, even if it’s a small step or change? The book was really helpful for me and Haley.? Roxy is nearly 12. That’s old for a GSD. She can’t run like she used to, and long walks are a thing of the past. Last month the vet said she looked good for an old lady, but still I worry….. We’re trying to find ways to keep her active — both physically and mentally. This book sounds like a winner to me! I’m glad Roxy is doing so well at 12 years old. I’ve had to shift gears on my thinking too and focus on what we can do together instead of those super long hikes, but you’ve got a great attitude too and there’s plenty of activities and fun to be had.? Very cool! We love natural and home remedies if at all possible to avoid surgery or meds. Sounds like this book has some great material in it! Yes! Any methods to avoid expensive and painful surgeries or the side effects of drugs are helpful.? I belong to a rescue organization, Norcal GSP Rescue, and we have a library of books for the people who adopt our dogs. If I win, that’s who I would like it personalized to. This would be a great book to add to the collection. It would be helpful for me, with my own dog, as well. What a fantastic idea, Carol! The book would make a great reference in the library and could help a lot of dogs and their families.? I have take classes with Mary relating to horses. Would love to hear more on her work with dogs and our relationship with them! Would enjoy reading her book, and would then donate it to the Herrick Community Health Care Library, where I work, to help improve the health of both human and canine! You’re on the same track as Carol with the great idea of donating the book. I love it! ?